While the Meltdown Festival has previously brought us wonders such as Jeff Buckley performing classical repertoire, it has taken me until now to get organized enough to take in a show from its programme. 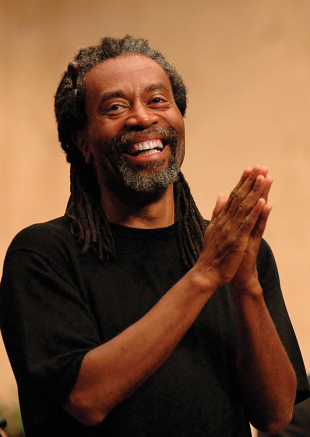 This year, with the jazz master Ornette Coleman curating, the selection of performers was very interesting indeed, but I naturally took to Bobby McFerrin. Having heard a few of Bobby’s live recordings, and seen his youtube videos, I knew his show would be dynamic and varied. He opened with 3 tracks of improvisation before satisfying some of his fans with a few of his standards. What impressed me was his pure enthusiasm for music and his love of sharing it with people - he had me crying with laughter one moment, and then feeling like dancing the next - and in fact, that’s what some of the audience got to do - Bobby let audience members on stage to dance / sing while he accompanied with improv. Even though I knew he’d be great on stage, I wasn’t expecting how truly inspirational he was in reality - after 2 standing ovations and an encore with Ornette Coleman himself, I honestly felt like going home and making my own music. I don’t think I can even recall feeling that stimulated by music by any show I’ve ever been to. I know I’ve said it alot before, but to not repeat it now would be travesty - if you get a chance to see him live, by all means do it! you wont be disappointed. This entry was posted on Monday, June 22nd, 2009 at 11:01 pm	and is filed under Bobby McFerrin, Jazz. You can follow any responses to this entry through the RSS 2.0 feed. You can leave a response, or trackback from your own site.